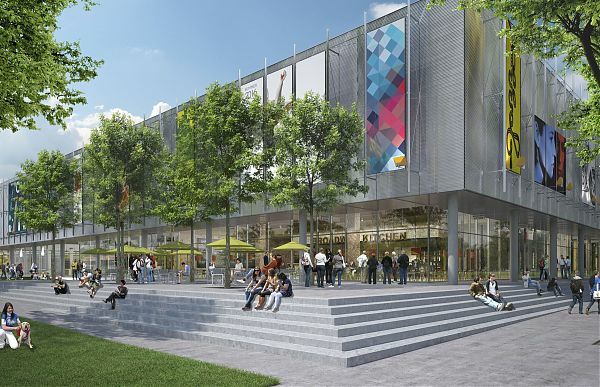 Rendering of City Center Bishop Ranch by Renzo Piano Building Workshop. Sunset Development Company. This fall, a 300,000-square-foot shopping mall will open in suburban northern California, built around a landscaped outdoor courtyard inspired by an Italian piazza. The first floor is all glass, the better to see the wares; above that, corrugated stainless steel. An Equinox gym anchors the mall at one end, a dine-in movie theater anchors the other. You can drink boba tea or a Berkeley microbrew, slurp ramen, or down a burger. In March 1954, a 990,000-square-foot shopping mall opened in suburban Detroit, built around landscaped outdoor courtyards, inspired by Italian piazzas. The first floor was all glass, the better to see the wares; above that, brick panels framed in concrete. A Hudson’s department store anchored the center. You could get a bite at the snack bar or candy store, or shop for dinner at the supermarket while your kids worked up an appetite at the playground.